Lexington Will history repeat itself? I found this editorial by Michael Graham in the Boston Herald courtesy of Instapundit. 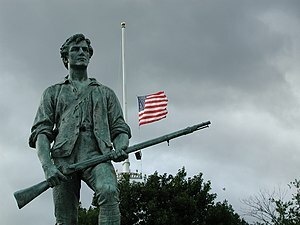 The position of pro-Second Amendment Americans is that gun ownership is part of the fundamental human right to self-defense, explicitly stated in the Constitution by the Founding Fathers due to an overarching political philosophy regarding the balance of power between the individual and the state. The media consider them the intellectuals in this debate. And so Fox News reports “White House In Gun Control Sprint.” President Obama wants to fast-track a stack of new gun laws before the lingering pain and horror of the Newtown, Conn., massacre fades. I thought the point of this White House task force was to “prevent more tragedies” like Newtown, as the president said when he announced it. If so, please re-read the last paragraph. Am I missing something? “Universal background checks” — whatever that means — might or might not be a good thing. They certainly sound reasonable to me. But how would they have prevented Adam Lanza from shooting up that elementary school? He took a rifle that belonged to his mother. The same with “tracking the sale and movement” of guns. I’m not sure about the constitutionality of forcing me to report to the government when I pass down my father’s shotgun to my son one day, but once again — this prevents another Newtown … how? And sure, I’m all for “strengthening mental health checks,” but unless you’re going to make your local gun store owner a licensed therapist, how does he stop a guy like Lanza — with no diagnosis of mental illness — from buying a gun? These are the thoughtful, well-reasoned ideas from the Obama brain trust? And we haven’t even mentioned the fact that gun laws are utterly meaningless to criminals, anyway. Don’t believe me? Ask the families of the 506 people fatally shot in Obama’s “gun-controlled” hometown of Chicago last year. I’m not one of the knee-jerk pro-gun types who oppose all laws. I don’t think of gun ownership as the highest form of patriotism. Show me a law on law-abiding gun owners that will have a meaningful impact on gun violence, and I’m all ears. But that’s not what the White House is offering. In the face of undeniable evidence that, for 20 years, gun ownership rates have gone up while gun deaths have plunged (the lowest since at least 1981, according to FactCheck.org), Obama’s pushing for a large-scale “punish-all-gun-owners” approach. So much so that some Senate Democrats are already backing away from the task force’s work. If the White House would stop playing on emotions for the sake of far-left politics, we could actually get something done about gun crime in the U.S. I don’t quite agree with Mr. Graham. I do not think that the Obama administration has misfired at all.They know exactly what they are doing. The long term goal of the Democrats has been to disarm the American people. I do not know whether this is because they consider guns to be icky or whether the conspiracy theorists are right and they want to inaugurate a one-world Socialist dictatorship and really it doesn’t matter. With that in mind and considering Obama’s ambition to be a transformative President who brings fundamental change to this country, it is unlikely that Obama is interested in compromising with anyone or in introducing the sort of do-nothing but pretend to do something policies like an assault rifle or high capacity magazine ban. Obama can take pride in the fact that he achieved the long standing Democratic goal of socializing health care in his first term and I don’t doubt that he would like to be the one who achieved comprehensive gun control in his second term. What this means is that that President Obama is going to try to enact the most sweeping and draconian gun control measures that he can get away with. If he cannot get what he wants through legislative action, he is perfectly prepared to issue executive orders. Nor is Obama reluctant to get into a confrontation with gun rights groups such as the NRA. Indeed, he seems to be deliberately provoking gun owners. Obama has shown a preference for attacking and demonizing people who oppose his policies, rather than working with them in the past. Since he can count on the support of the main stream media in labeling his opponents as unreasonable extremists, he has a record of winning these confrontations and forcing his opponents to back down. In this way, Obama has often got everything he has wanted rather than having to settle for only a portion. Of course, this has embittered his opponents and cause more division and polarization in the country, but I don’t think Obama minds that at all. I think, then, that we can expect sweeping and unprecedented gun control proposals to come out of Biden’s task force. We can expect continuing demonization of gun owners as crazed extremists in the media and the NRA getting the full Alinsky treatment. Don’t be too surprised if major retailers such as WalMart “voluntarily” remove objectionable firearms from their shelves. We are in for some interesting times ahead. 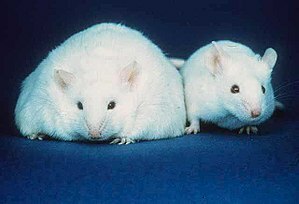 Guess which mouse has the bacteria inside it. Here is a story that might make you feel better about eating too much at Christmas get togethers. According to a study in China, it isn’t how much we eat or how little we exercise that makes us fat, it is what bacteria we have in our colons. I found the article in the Financial Times through Instapundit. Obesity in human beings could be caused by bacterial infection rather than eating too much, exercising too little or genetics, according to a groundbreaking study that could have profound implications for public health systems, the pharmaceutical industry and food manufacturers. The discovery in China followed an eight-year search by scientists across the world to explain the link between gut bacteria and obesity. Personally, I think that diet and exercise might have a little to do with obesity. If this study proves to have merit than it might pave the way to more effective weight loss methods. This isn’t the only article I have read indicating that human intestinal bacteria might have a profound impact on our health and clearly a lot more research needs to be done in this field. Here is a sentence in the middle of the article that ought to make anyone think for a minute. Governments around the world are grappling with an obesity pandemic. Do you know how truly weird it is that governments around the world have to deal with obesity. It wasn’t that long ago that the major preocupation of most governments was preventing their citizens from starving. The fact that a large portion of the population of the world may suffer from having too much food is simply unprecedented in human history and represents a triumph of man over nature, if not an entirely unprobematic one. It’s a good thing I check Instapundit everyday. 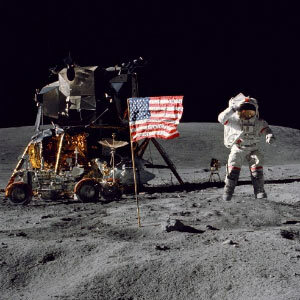 I didn’t realize that today was the anniversary of the first moon landing until Glenn Reynolds reminded his readers. He put in a link to Apollo images from NASA. There were indeed giants in those days. Lesser sons of great sires are we. Human Swallows Pill. Mosquito Bites Human. Mosquito Dies. From the New York Times. I like this. A cheap deworming pill used in Africa for 25 years against river blindness was recently shown to have a power that scientists had long suspected but never before demonstrated in the field: When mosquitoes bite people who have recently swallowed the drug — called ivermectin or Mectizan — they die. Where can I get some of this? I would love to watch mosquitoes die. It turns out, though, there are a couple of drawbacks. Other scientists caution that while the mosquito-poisoning trick is pretty nifty, it is not very practical: For it to work effectively, nearly everyone in a mosquito-infested area must take the pills simultaneously. Getting thousands of villagers to do that even in annual deworming campaigns is a logistical nightmare, scientists said. The mosquito-killing effect appears to fade out within a month, so it would need to be repeated monthly. Also, in rare cases, the otherwise safe drug can be lethal. It doesn’t seem to kill the mosquitoes right away. It shortens their life span so that they do not live long enough to acquire the parasites that cause malaria. 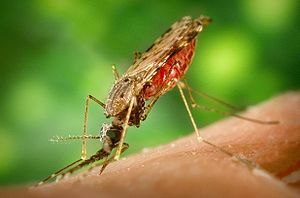 That’s not as much fun as having mosquitoes bite me and then die, but it could be very useful for controlling malaria. Still this is Africa so distribution is a problem. Not to mention health problems not generally found in the developed world. It might be useful, he suggested, in areas with brief, intense malaria seasons. Also, when people with lots of worms are treated, they suffer fever and intense itching as the worms die. Though that might be bearable once a year, it discourages people from seeking treatment more frequently. And ivermectin is dangerous for a few people — those infested with large numbers of a relatively rare West African worm, the loa loa. These worms circulate in the blood and lungs and may jam capillaries when they die, potentially causing coma or death. Detecting them means drawing blood and viewing it under a microscope. Still, it is promising and I hope it works out. Did I mention that I really hate mosquitoes?